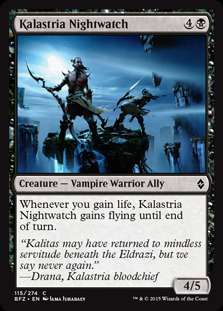 When I first previewed the Allies from Battle for Zendikar, I was pretty skeptical that there was enough power level to make a dedicated Allies build work. But in this case I am glad to be proven wrong, although technically the Allies is only a small part of what makes this deck work. 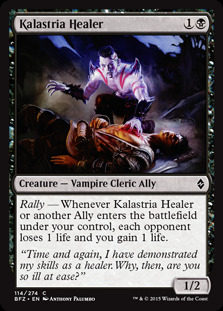 Tajuru Stalwart in a three color deck is an excellent 3/4 for 3, while the combination of Kalastria Healer and Kalastria Nightwatch makes the latter a very powerful card. 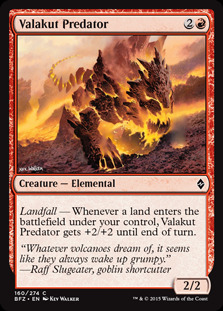 The deck also benefits from the excellent Elvish Visionary, the late game value of Valakut Invoker, and the best of the new Landfall creatures in Valakut Predator. 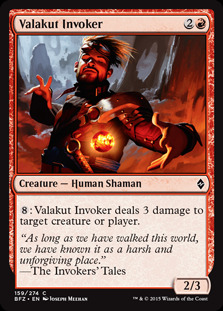 The deck also has just enough card draw, combat tricks, and removal to help clear the way when need be or survive against early game aggression. Have you played with or against this deck? If so, what do you think of it? Let me know in the comments below. Also, don't forget that I am seeking feedback on what topics YOU would like to see me write about in the upcoming year. Please let me know by commenting on the linked post. Thanks so much! I don't think I've played against this list but ZombieNeko is always trying new BGx things and he knows his stuff. I remember playing against a similar deck from Malum in the early days of BFZ and I was quite impressed. So I'm positive that this deck is probably pretty real!